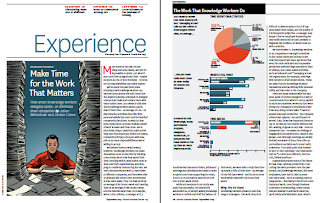 "Make Time for the Work That Matters" is an article from the Sep 2013 issue of the Harvard Business Review, written by Julian Birkinshaw and Jordan Cohen. 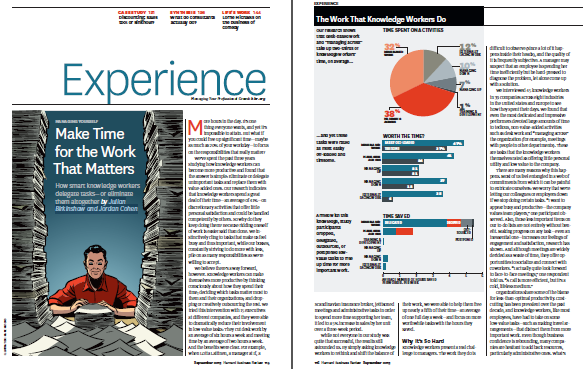 For the time being, the full article is available on the HBR site, and not behind a subscriber paywall. The article promises to shed light on a problem that has defied a workable and lasting solution - how to spend more time on the really useful things. While the article does a good job of articulating the pressing need for to save time in the workplace, the proposed solutions however fall short of what would qualify as meaningful or workable. Feeling like we don't have enough time on our hands is not an unsurprising feeling that most executives - at all levels in an organization - have. Appearances aside - that looking busy is often seen to be as important as being busy, even meetings that feel like giant wastes of time are seen as offering "opportunities to socialize and connect with coworkers." While top-down interventions can help, often they run into the resistance of institutional norms, and "knowledge works ... find creative ways to resist or game the system." "We instinctively cling to tasks that make us feel busy and thus important"
The authors propose a "variant of the classic Start/Stop/Continue exercise", and claim that "[W]ith relatively little effort and no management directive, the small intervention we propose can significantly boost productivity among knowledge workers." But also warn in the very next sentence that "[S]uch shifts are not always easy, of course." If you look at the time saved after the "interventions", while close to six hours per week were saved by delegating, outsourcing, dropping, or postponing desk-based work, there doesn't seem to have been any reduction or savings in time in "Managing Up", even though it accounted for an admittedly small 7% of the time knowledge workers' spent on, and 21% agreed it was "tiresome" and an equal percentage agreed it was "easily off-loaded". Clearly, the respondents agreed with Michael Watkins, who, in a June 2002 HBS Working Knowledge article: How to Succeed With Your New Boss (2002), says "Managing up is as important as managing down" - even if they agree the activity is "tiresome" they cannot come to doing the "off-loading" part. Freeing up time is a task far more difficult and complicated than the article suggests. It also ignores the distractions in the form of social media and internet browsing that intrude into a knowledge worker's typical day. This article is a disappointment and needed more careful research and arguments to elevate it from a "filler".